Single, sweet and eighteen years undead. Doesn't have a heart but would be happy to eat yours. Likes O Negative cocktails and spleen slushies. Enjoys Romero comedies but hates The Walking Dead. Searching for a fellow zombie to cuddle in blood and watch Warm Bodies with. Must love a girl with brains. Kind of mandatory when there's not much else. No blood and gore for the final look. Just some good ol' body paint. And zombies. Because nothing in life is complete without zombies. It has been a long time since I've done body paint on myself. It's even longer since I wore a wig and contacts, almost a year. I try to avoid contacts for as long as I could, but this look required them. It would feel unfinished without. I proud to say these pair of contacts only took me fifteen minutes to apply! It used to take me an hour and a half. 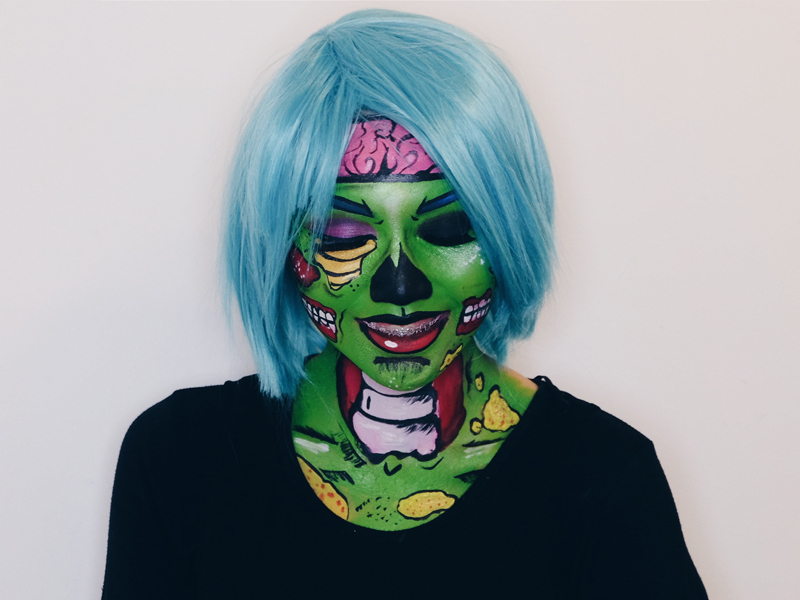 Mykie from Glam and Gore, and Jordan Hanz inspired me to do my version of a Pop Art zombie! 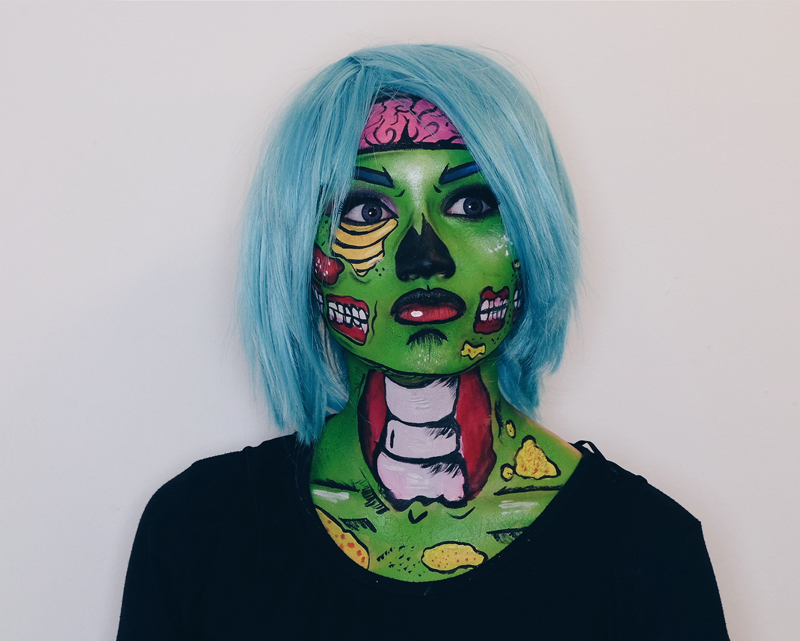 My first pop art zombie but definitely not my last. There is some joy gained from looking like a comic book character ala iZombie. I kept laughing whenever I looked at myself in the mirror. They are so much fun to do even if they are time-consuming. I spent six hours painting everything but I feel it was worth it. Just ignore the small patch on my trapezius. I missed that spot. Before I started, I had a clear idea and concept in mind. First, I sketched out the general design with NYX Wonder Pencil in 01 Light and glued my eyebrows down with a gluestick. For makeup, I used Snazaroo Face Paints and Wolfe Art mostly. I applied the base colours then lined it with black face paint or Maybelline Gel Liner in 01 Black. I highlighted the most prominent areas using Urban Decay Electric Palette in Revolt. For the eyes, I used Urban Decay Original Primer Potion and lined with Essence Long Lasting Kajal Pencil in 01 Black. I knew I would have two different eye looks. The left eye shown would be a black smokey eye to provoke the idea of a hole than an eyeless socket. With Maybelline Gel Liner in 01 Black (again) as a base, I blended it all with Urban Decay Naked Basics in Crave and Electric Palette in Freak. For the other eye, I used Electric Palette in Jilted and Urban to create a bright purple eye. I thought it looked great against the green. Then used the gel liner to create a thick wing. To finish everything off, I applied E.Asbellah False Eyelashes in Snow White. They are the prettiest, and thickest lashes I own. With the lips lined with Essence Long Lasting Kajal Pencil in 01 Black, I applied NYX Macaron Lippie in Chambord on the upper lip and NYX Soft Matte Lip Cream in Amsterdam. I added white face paint on the left corner just to make it more comic book-esque. Speaking of making things more comic book-esque, adding small details truly finishes the look. By adding small hatch marks to add shadow, it just makes the look more fun and pop art. I also added a few random white and black spots to once again, highlight the comic book feel.. Put on some contacts and a bright wig, then done! This look was made in collaboration with Kaleidoscope. I had worked with them last year to create some fun. They invited me back to create a quirky and kooky look to advertise their annual event Shocktober! If you're in Brunei, go check out their Instagram here for more information. There's also a little time lapse of the makeup process here if you'd like to see. Be warned, I don't have any makeup on. I look like a normal girl than a smokin' Zombae. So what do you think? 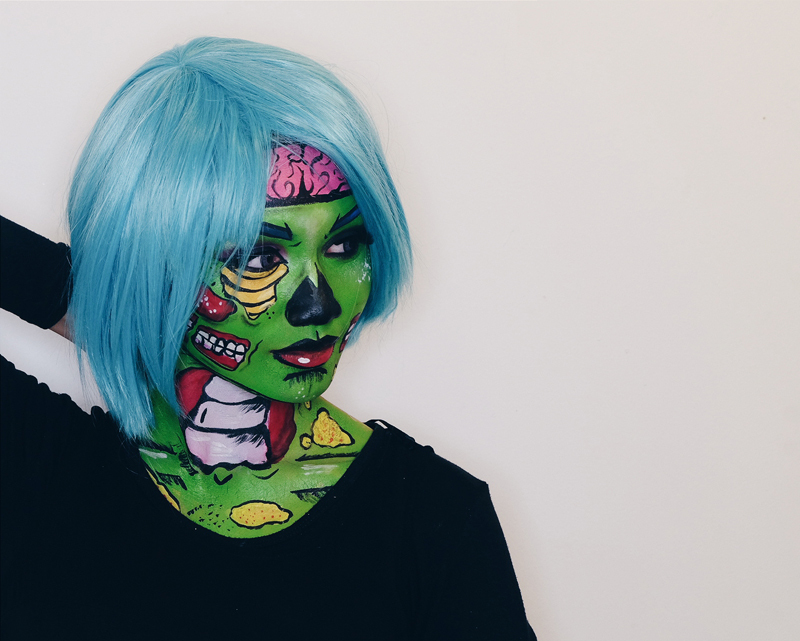 Would you dress up as a Pop Art Zombie? P.S Huge thank you to Kaleidoscope for inviting me to do makeup for the photoset, and Sara for lending me her wig! this is so colourful and well done! I loved seeing the process on instagram! Omg you are amazing! What a look? I love! Can't stop laughing at 15 minutes to put on the contacts. That could be tricky sometimes, I relate. October is truly your month and you are having great fun with this. Literally the most amazing make up I have ever seen. Just WOW! This is crazy! I love everything about this!!! Oh my god so cool! I love that you went with a pop art concept. It's such a fresh idea and you executed it just beautifully Bash! So talented girl! I can't say it enough! Love this! This is amazing, you did such a remarkable job. I can't believe how long it takes to do this, I can only imagine. Love your Sombae! This is so cool! I didn't even recognize you! This is so detailed and intricate- beautiful!! Coolest zombie ever! I love the comic art! Love this! The makeup is so cool, I think it turned out amazingly! Great post! WOW! I am incredibly impressed by your SHOCKTOBER look! I am seriously in awe. I didn't think I could ever find a zombie so attractive. You got talent FOR SURE. This is such an incredible makeup look! Girl, you are seriously so so talented! Love this idea so much and it is so unique as well - haven't seen anything like it out there yet. This is amazing, I could never do this on my own! Absolutely talented girl! 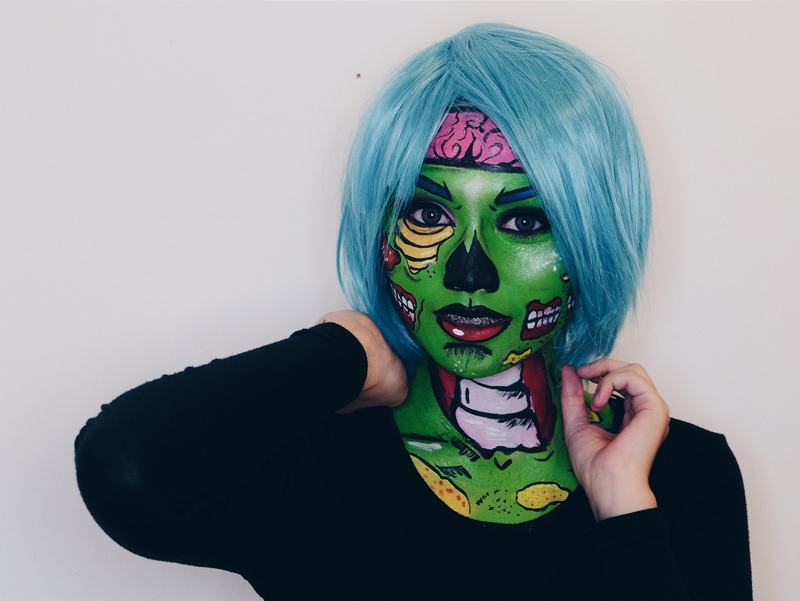 This is amazing you look like a real life zombie doll, you're so creative, I had no idea you could do this, I love it! This is insane!!! Wow :) amazing. This is so impressive! You have an amazing talent, girl! This SFX of yours reminds me of KAWS bearbrick that I have always wanted to collect. I find this amazing and probably by far my favourite.